Albania’s capital city Tirana doesn’t have the reputation of being the most beautiful, but I ask you to try agreeing with that from the view atop Mount Dajti overlooking the city. Something more objective however is Tirana’s ad-hoc system for pretty much everything, including public transportation. 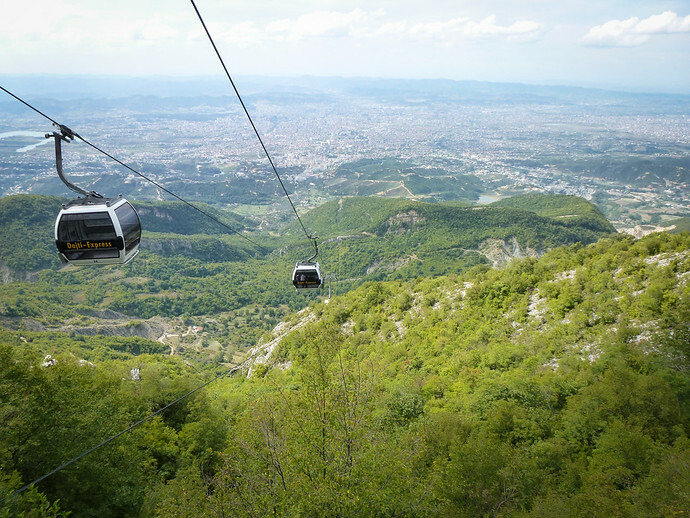 You can get to the top of Mount Dajti, just outside of Tirana, by taking the Dajti Ekspress, the longest cable car in the Balkans. There are a lot of options for getting there but only a few that make sense. 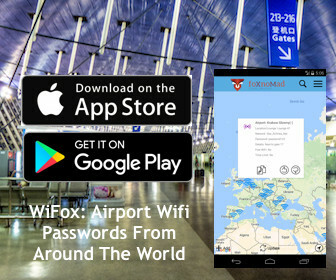 Here are the best ways to get to Mount Dajti. Before you do anything, it’s important to make sure you have, or withdraw, enough cash for the journey as well as cable car. The credit card machine at the base station hasn’t worked in forever – show up with only a Mastercard and you’ll have to go all the way back into town. Cash To Bring – A round-trip cable car ticket is around 800 lek ($6.30 dollars) and the bus about 65 lek (.50 cents US). There’s a good cafe and restaurant up at the top that do accept credit cards but I wouldn’t rely on them, so bring extra cash to enjoy some food as well. 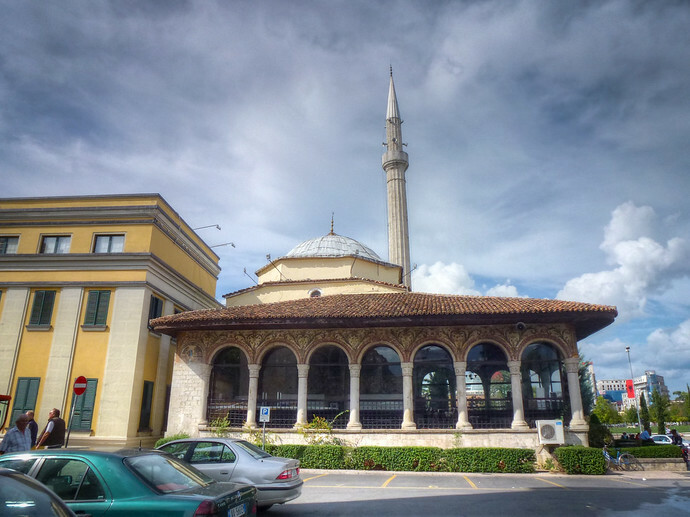 Head to the Et’hem Bey Mosque in the center of town. Looking at the Et’hem Mosque (with the clock town on the left) about 50 meters to the left is a bus station. You’ll see people waiting around, possibly a bus, or neither. Look for the Linze bus and confirm with the driver he or she is headed toward Dajti. Dajti Cable Car Hours – From 10am to 7pm (winter); extended hours to 10pm during the summer months. The Dajti Ekspres cable car is open everyday except Tuesdays. The trip from the bus station to nearby the cable car station is about 25 minutes. Go to the last stop – it also helps to sit near the front so the driver can let you know you’re at the right place. From this point, you’ll have to walk about 10 minutes uphill following signs that aren’t very accurate. As you walk in the direction the bus was pointing when it arrived at the station, ask every few shops to make sure you’ve not gone off track. The shop owners are very helpful, often leaving their stores to give overly detailed instructions for the deceptively winding roads. Unless you’re arriving with a bicycle, get a round-trip ticket up to the top by taking the 3.6 kilometer (2.2 mile) Dajti Ekspres cable car. 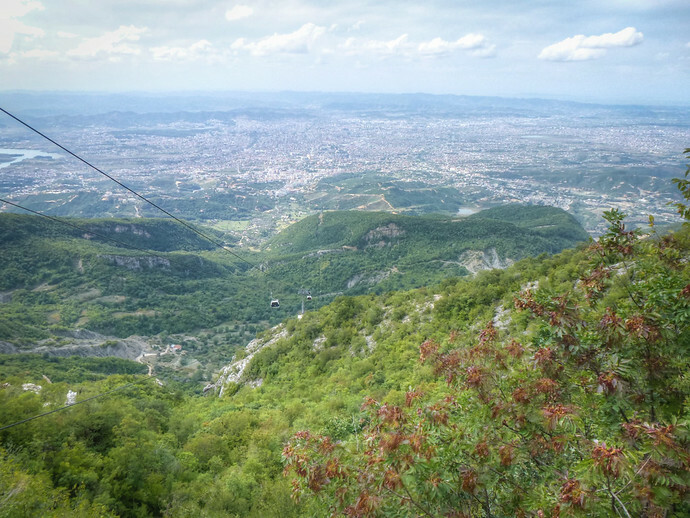 A lovely 20 minute ride, unless you have serious fear of heights, take in all of the views of Tirana on the way. After arriving don’t miss the countryside on the far side of Mount Dajti. Meal With A View – Although the pizza is pretty good, be sure to get a seat by the window, even if there is a wait at Ballkoni I Dajtit, the sight is spectacular. Taxi is an option but you’ll have to negotiate your way there, expect to pay about $15 USD for a one-way ride. There’s also a shuttle which connects with one of the bus stops but since there’s no set timing information available, consider it the very leisurely (possibly uncertain) way up. Up, by the way, is the direction it’s easiest to go – finding a taxi nearby, especially close to closing hour means bus is likely the only way you’ll be getting back into town. From your photos, Tirana looks beautiful. I would love to take the cable car ride and see views like that! It’s really beautiful actually, especially from this 1600 meter high angle! cable car was great ,, so high and the view wow, revolving restaurant was good for a beer and view . Forest at top of mountain is nice , horse rides and shooting gallery from the locals to entertain you. Cable car car park was also a good place to camp the night .